The Handley Page HP.115 was a British delta wing research aircraft built by Handley Page to test the low-speed handling characteristics to be expected from a supersonic airliner of slender delta configuration. It formed part of the British supersonic aircraft research programme, carried out in the 1960s and sponsored by the Ministry of Supply, that eventually produced the Concorde. Through the 1950s various studies on supersonic transports (SSTs) suggested that the economics of such designs were far too poor to be practical. Lift is generated in different ways at supersonic speeds and achieving reasonable lift-to-drag ratios requires the wings to have a very short span. This works well at supersonic speeds, but offers very little lift at low speed. In order to make a design that is able to take off and land on existing runways, either the aircraft would have to use wider wings and lose supersonic cruise economy, have enormous engine power, or be extremely large. A way out of this dilemma was presented in the UK by Johanna Weber and Dietrich Küchemann around 1955. Their team at the Royal Aircraft Establishment (RAE) noticed that delta wings generated large vortexes over the wing when flying at low speeds and high angles of attack ("alpha"). The vortexes increased the speed of the air on top of the wing, thereby greatly increasing lift at low speeds. This effect was magnified by the length of the wing, and the sharpness of the angle of the leading edge - more sweep led to stronger vortex creation, more length gave it more room to operate over. This suggested that an aircraft with a delta wing running the majority of the length of the fuselage at very great sweep angles, over about 65 degrees, would have reasonable low-speed performance while also keeping the supersonic drag to a minimum through its limited span. The concern was the angles needed to generate the vortexes. The aircraft would have to fly at what would be considered significantly nose-high attitudes, especially on takeoff and landing. They would also need very long landing gear, especially in the nose, in order to keep the wing at a high angle during the takeoff roll. This led to some questions about the handling and control of such a design at low speed. At the first meeting of the Supersonic Transport Committee in 1956, the need for a dedicated low-speed testbed aircraft was decided to be paramount. The test aircraft needed to fly only at very low speeds, so it was originally decided to build an unpowered glider that would be towed by a Canberra aircraft to a high altitude of around 30,000 ft (9,140 m). Development was awarded to Slingsby Sailplanes as the Slingsby T.48. However, after reviewing costs, it was estimated that a powered version would achieve 200% more flying time at 95% less cost per hour. Development of the T.48 ended and a new contract for a powered aircraft started. The contract was quickly won by Handley Page and their HP.115 design. The HP.115 featured a delta wing of very low aspect ratio swept at 75° and a fixed tricycle undercarriage derived from the main gear of a Percival BAC Jet Provost Mk 1 and the nosegear from a Jet Provost Mk 2. The fuselage was a shallow rectangular section girder, with a nacelle at the nose to house the cockpit. 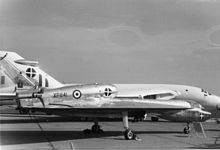 It was powered by a single Bristol Siddeley Viper turbojet set over the wing at the base of the tailplane fin. The fin had a bullet fairing at the top to accommodate a cine-camera to record airflow visualisation experiments, some of which employed smoke generators mounted on the wing leading edges. The airfoil section was a modified bi-convex type with the maximum thickness at 4% of the chord. This section was chosen as being representative of the type likely to be adopted for a supersonic transport. It had a favourable chordwise distribution of cross-sectional area and hence a low wave drag in supersonic flight. A unique plywood leading edge was employed wherein new sections of different degrees of camber could be substituted, although in practice this feature was never used. Built by Handley Page at Cricklewood factory, the single aircraft XP841 flew for first time on 17 August 1961 at the Royal Aircraft Establishment Bedford, with J.M. Henderson at the controls. It was subsequently used for low-speed research in support of the Concorde development programme while the BAC 221, (a modified Fairey Delta 2) covered high-speed research. The HP.115 was a very capable aircraft; pilots were able to demonstrate rapid changes of bank, while still safely retaining control at speeds as low as 69 mph (111 km/h). Despite two minor mishaps, the experimental programme was a very lengthy one continuing until 1974, providing significant data regarding delta wing operations on takeoff and landing. Neil Armstrong was due to fly the HP.115 as a test pilot in 1962, but after his selection as an astronaut, NASA refused him permission to fly the aircraft. He eventually flew it on 22 June 1970. Following retirement at RAE Bedford, XP841 was placed on display at the museum at RAF Colerne. Following closure of the Colerne museum the aircraft was moved to the Royal Air Force Museum Cosford and placed on display. With the opening of the Concorde exhibition at the Fleet Air Arm Museum XP841 was moved south to RNAS Yeovilton. XP841 is on display as part of "The Leading Edge Exhibition," alongside the BAC 221 and a Concorde prototype. ^ a b c Conway 2005, p. 67. ^ Green, John (12 January 2015). "Obituary: Dr Johanna Weber". Royal Aeronautical Society. ^ Maltby, R.L. "The development of the slender delta concept". Aircraft Engineering. 40, 1968. Archived from the original on 4 April 2012. ^ Ellison, Norman (1971). British Gliders and Sailplanes 1922-1970 (1st ed.). London: Adam & Charles Black. p. 216. ISBN 0 7136 1189 8. ^ a b c Winchester 2005, p. 134. Conway, Eric (2005). High-Speed Dreams: NASA and the Technopolitics of Supersonic Transportation, 1945–1999. JHU Press. ISBN 080188067X. Barfield, Norman. "Aérospatiale/BAC Concorde." Aircraft in Profile, Volume 14. Windsor, Berkshire, UK: Profile Publications, 1974. ISBN 0-85383-023-1. Winchester, Jim. "Handley Page HP.115 (1961)." X-Planes and Prototypes: From Nazi Secret Weapons to the Warplanes of the Future. London: Amber Books Ltd., 2005. ISBN 1-904687-40-7. Ellison, Norman (1971). British Gliders and Sailplanes 1922-1970 (1st ed.). London: Adam & Charles Black. p. 216. ISBN 0 7136 1189 8. Wikimedia Commons has media related to Handley Page HP.115.